In 1997 Chuck Hawkins was granted permission by the Garden River First Nation to guide anglers on the Garden River in the fall of each year. We have private salmon and steelhead fly fishing for our clients with this access. 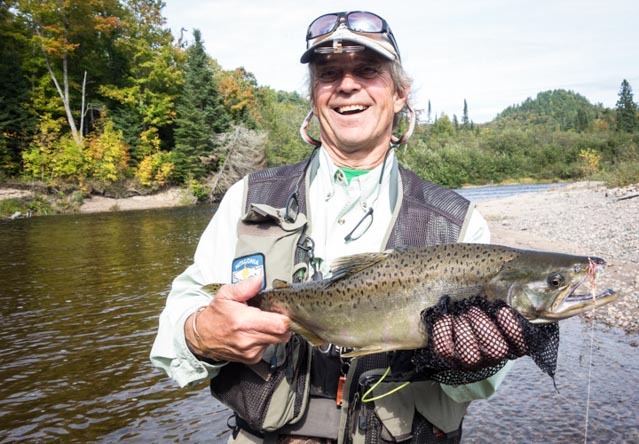 Due to the remote nature of the river and the incredible runs of salmon many knowledgeable anglers call this the best salmon fishing in the Great Lakes. Hawkins and his native guides will show you how to catch salmon and steelhead with both streamers and nymphs. You will see salmon chase down and kill a stripped streamer. Steelhead will take both dead drifted eggs and stripped or swung streamers. If cohos come in they will be the first to your fly. The pink salmon fishing is the best in the Great Lakes. Seems like thousands of these smaller salmon ascend the Garden River each year. Wildlife is abundant, eagles, bears, wolves and moose are all present. The scenery is unsurpassed. The fishing is fantastic and you won’t see anyone but those in your party. Try the Garden River. Due to the privacy you will experience peace, solitude, and great fishing. You won’t be disappointed. Chuck Hawkins maintains a fishing report during his trip. We are now booking the 2019 season.